Incredible winter sale from Gibson Performance Exhaust at CARiD! Here at CARiD, we try to do our best to make your shopping easy this season. Check out our amazing Happy Holidays 2014 deals from Gibson! The Gibson company is one of the largest and most trusted performance exhaust system manufacturers in the industry. It’s manufacturing plant uses the most modern processes to produce their exhaust systems.Besides the best performance, every Gibson performance exhaust system is also designed to give you the right sound and the appearance you want. Furthermore, Gibson “custom power tunes” every system to each specific vehicle. 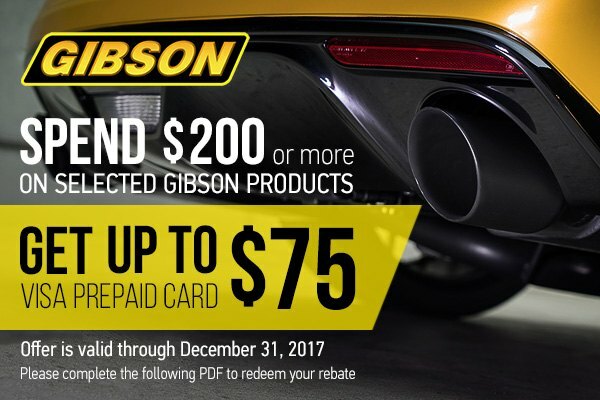 Purchase $100+ of one Gibson Exhaust product value and receive a $25 mail-in rebate, buy $400+ of one Gibson Exhaust product value and receive a $50 mail-in rebate, buy $800+ of one Gibson Exhaust product value and receive a $75 mail-in rebate. Hurry up! The offer is valid through January 31, 2015. Quick Reply: Incredible winter sale from Gibson Performance Exhaust at CARiD!